Year of the Dungeon: The Next How to Host a Dungeon? This weekend I discovered that I'm near the bottom of the second printing of How to Host a Dungeon! So now I'm starting to think about what the next printing will look like. So what do you want to see or think would be cool in a new version of How to Host a Dungeon? Good as is? Needs more monsters and villains? Or something else entirely? I'd like to see optional rules systems that develop it into a genuine solitaire game, with goals and interesting decisions. Like, you want to reach Glory score X, or ensure each age lasts X turns, or foster a chosen civilization so it touches all four map edges. Or something like that. Make it possible to win or lose. And yes, I will freely admit that maybe I'm a bit slow; it's just a tad confusing for some reason. I recently introduced my brother to the game, and he and I started on a list of small issues that we felt needed fixing. As Boric G alluded to, there are portions of the rules explanations that are a bit... challenging. I think that some of the text just needs to be cleaned up and made clearer. Of course, you could always add more races, etc etc. First and foremost, I would second that I would like to see optional rules that develop it into a genuine solitaire game with goals etc. Or how about rules for creating a simple characters to romp through and try to destroy what has developed witin, again just for solitaire, we have RPG's and miniature rules for dealing with this otherwise. Also I would, like Boric G, like to see more examples of play. 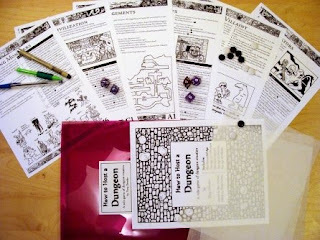 But as I said before, push a little bit more towards a solitaire version (that we could all still use as a dungeon builder as well, honestly I use this for my kids when I build Fighting Fantasy RPG dungeons now, they do it with me them I GM the dungeon). A solitaire goal orientated version would be fantastitc for those longer journeys, or an evening of peace and quiet (with kids, your having a laugh! ).